East Shore Unitarian Church is blessed with an abundance of musical talent and enthusiasm within the congregation. 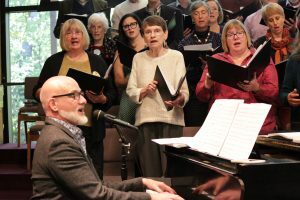 Led by Interim Director of Music Eric Lane Barnes, our Sunday services include a wide variety of congregational songs (often including pop songs, show tunes, jazz standards, songs from various spiritual traditions and, of course, Unitarian hymns.) Each service features several Musical Celebrations, which may be a vocal soloist/duet/ensemble, and numerous combinations of guitars, ukuleles, drums, flutes, saxophones, violas, pianos – our roster of service performers is truly endless and delightfully eclectic. ESUC also periodically presents guest appearances by visiting choirs and performing groups such as Rhythms of India, and The Beijing Queer Chorus. Twice each month (sometimes more!) the East Shore Choir sings during the service, filling the sanctuary with exquisite musical joy, laughter, light and love. The East Shore Choir continues to break new ground exploring new styles of music and presentation, drawing inspiration from a wide variety of choral, theatrical, classical and world traditions. Membership in the choir is open to all – no audition or even church membership are required. We rehearse in the sanctuary on Thursday evenings from 7:30 to 9:00 p.m. Rehearsals are joyous, engaging, invigorating and sometimes moving. As one East Shore Choir member said, “The minute I leave rehearsal I immediately look forward to the next one. I have never had more fun while singing, or felt more connected with myself and my choir family.” Join us! You’ll be glad you did! For more information contact Eric Lane Barnes.